The number of apps in the Google Play Store grew by more than 50% last year, outpacing Apple’s App Store for the first time. Google Play’s developer community has been growing for the past three years. Taking a look at the charts below there is a major growth in the number of apps and developers in the Google Play Store, iOS App Store, as well as the Amazon Appstore from 2010 to 2014. Google ended the year 2014 with over 1.43 million published apps, compared to Apple’s 1.21 million. 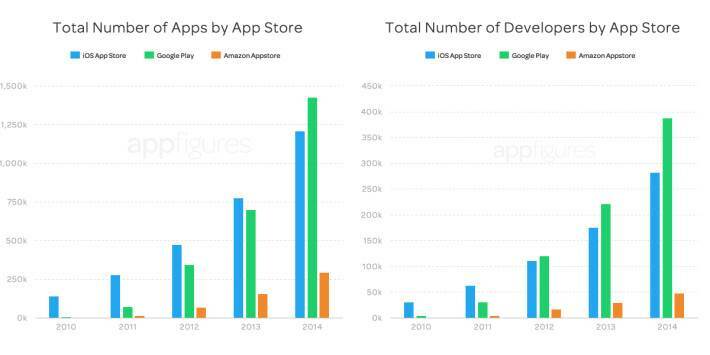 Amazon is still very far behind, finishing the year with only 293,000 apps in all. There is also a total number of developer growth for each platform. Google finished the year with almost 400k developers, while Apple nearly made it to 300k. Amazon is nearing the 50k mark to finish out 2014. Google Play is growing much faster than Apple’s App Store because Android is much more popular than iOS globally, and its developer base is simply larger. Also, the difference has a lot to do with the way Google and Apple publish apps in their respective stores. Apple has a more rigorous app approval process before anything can get published, while Google is more lenient and fixes problems and violations after the app is published. Google is surpassing Apple in terms of growth, it’s not a measurement of developer preference. Many app developers still launch on iOS first, and then build their Android applications. That’s because Apple is where developers are generating most of the revenue. But Google’s growth is a hint at the maturation of Apple’s App Store growth has slowed in comparison with other years.